I am going to be laying some new 8" wide Pine Flooring. It is to be done old school, in that it will be butted edges (No t & g) and face nailed. My issue is the colour. They have requested an aged appearance (see image) but I have yet to match it close enough for their liking. I've tried staining, but as expected it ends up blotchy and inconsistent in Pine. Any suggestions are greatly appreciated! Thank you! They'll have to wait. The floor in the picture was stained and then it aged to that color. If you make it that color to start out with in a few years it will no longer be that color. If you want to dye or stain it you will need to condition the pine to kill the blotchiness. Otherwise put some color in the finish and it will be much more even. Put a clear coat on it first and then use the colored poly to get to the final color. Put a clear coat over it as the final coat. Plus the color in the picture is wrong. I color corrected it and the true color is much less bright. Pine floors don't take stain very well. It wears unevenly, and is hard to maintain. Pine varies in density enough that the softer wood wears away quickly, and the knots don't. The customer would be better off with oil finish, renewed as needed. I have used 12d framing nails in an air nailer to nail pine down. The oil fills in over the heads, and the nails don't loosen up. 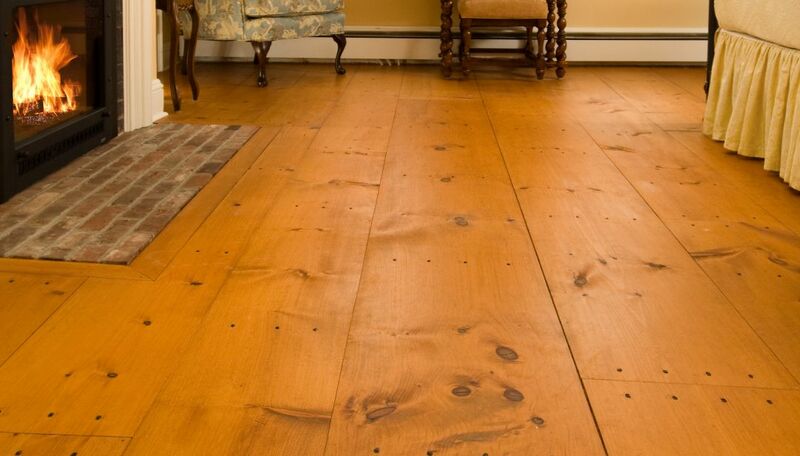 The important idea to stress is that a pine floor is not static, it moves and changes color over time and in wear areas. In other words, it's not laminate. It's based on a white point. I know the radiators are white. Then you readjust the picture so they are white and the other colors follow. Looking at the picture now it looks like there is a bit to much blue (in the brick) in the pic. But the color of the floor is much closer in the fixed picture then the original. Plus it's one of the automatic fixes in my photo editing programs. I tried several ways to get there and most of them led me to the pic I posted. The floor was much to bright. But maybe the client likes that. Just figured I'd point it out. Try a base color of dye or stain controller. Then maybe seal and then a glaze, then final clear coat. Sherwin-Williams has a light color dye that may work. It can be used for cement, too. Thanks for that. Although there are hundreds of shades of white out there, and no guarantee that the radiators match a standard white balance card. This is a good reminder to set the white balance to match the available light before shooting a scene. Absolutely correct. But it's a lot closer then the original picture which had glowing orange floors. Sometimes the auto white balance doesn't work at all. Then I need to go into a more manual white balance and take some educated guesses. Any reason to not just use a garnet shellac, or some shade close? Its what alot of old pine floors where finished with.